There continue to be legitimate questions surrounding whether or not Dawkins can be a capable pass protector as an NFL tackle as he ranked 104th this week among 118 qualified offensive tackles with an 87.5 pass block efficiency rating (PBE measures pressure allowed on a per-snap basis weighted towards sacks) after he surrendered four total pressures (including a sack) on 26 pass protection snaps (he mixed in with the starters early on and then played on and off throughout the game). Dawkins’ ability as a run blocker though should allow him to take over the starting right tackle job – it’s not like Jordan Mills is a stone wall in pass protection himself – as long as he can prove to not be an absolute trainwreck in pass protection. His 94.7 run blocking grade this weekend led all tackles, and by a significant margin. Splitting time between center (20 snaps) and right guard (22 snaps) while playing with the second-team offense, Feeney showed off his ability to play multiple positions across the offensive line (he also played right tackle last year at Indiana). Feeney allowed just one pressure (a hurry) on 28 pass blocking snaps, quite an improvement after he surrendered three pressures on just 23 pass blocking snaps the week prior against Seattle. Tankersley made it onto the field to start the second quarter and played the rest of the game, leading all cornerbacks with 55 snaps this week. During those 55 snaps, the Clemson product compiled the second highest overall grade among corners last week (trailing just Brandon Williams from Arizona who graded at 90.0) to go with an equally as impressive 88.6 coverage grade. Tankersley was targeted in coverage three times and he allowed just one reception – for a total of five yards – while picking off a pass. He didn’t make it onto the field until the fourth quarter, but Westbrook really had things clicking with second-year QB Brandon Allen this week. 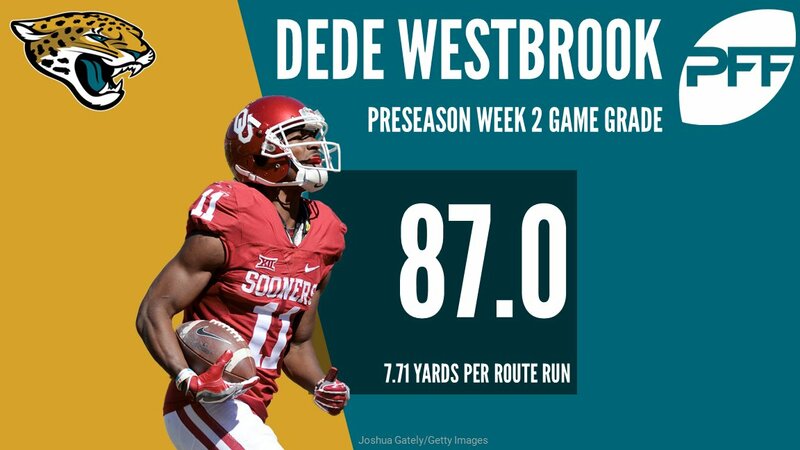 Westbrook’s 87.0 overall grade led all receivers this week, along with his average of 7.71 yards per route run and his 118.8 WR rating (passer rating when targeted) ranked sixth among receivers this week as he hauled in six of seven passes for 131 yards. Seeing all of his action in the second and third quarters, Mack led all running backs this week with his 87.0 overall grade. Mack’s still-absurd-despite-the-small-sample-size 548.6 elusive rating (which measures a runner’s success beyond the point of being helped by his blockers) led all backs this week. He averaged 6.4 yards after contact per attempt and was the only HB to force five missed tackles on five or fewer carries. Roberts caught both of his targets for a total of 29 yards while forcing a missed tackle, but it’s his work as a run blocker that we’re highlighting this week: playing with Jake Rudock and the second-unit, Roberts led all tight ends this week with his 84.2 run blocking grade. Playing alongside Bower for much of the night, Johnson finished the second week of the preseason ranked second among all defensive interior players with his 88.3 overall grade – and he led the position with his 94.7 run defense grade. 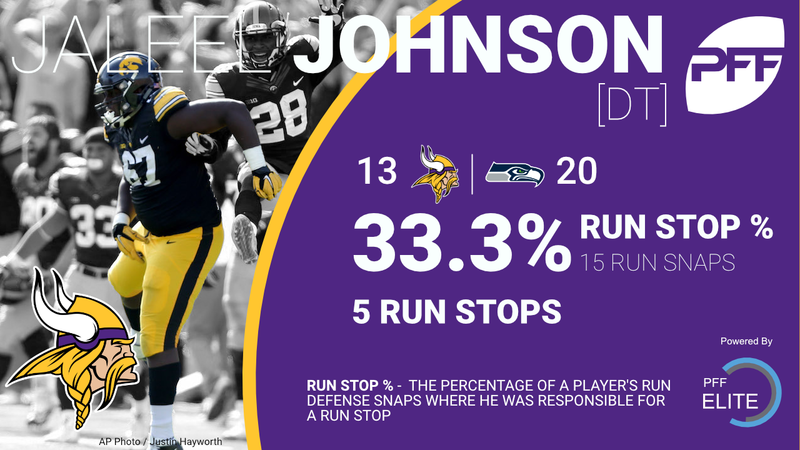 Johnson led all defensive interior players last week with five run stops, nobody else at the position even had four. 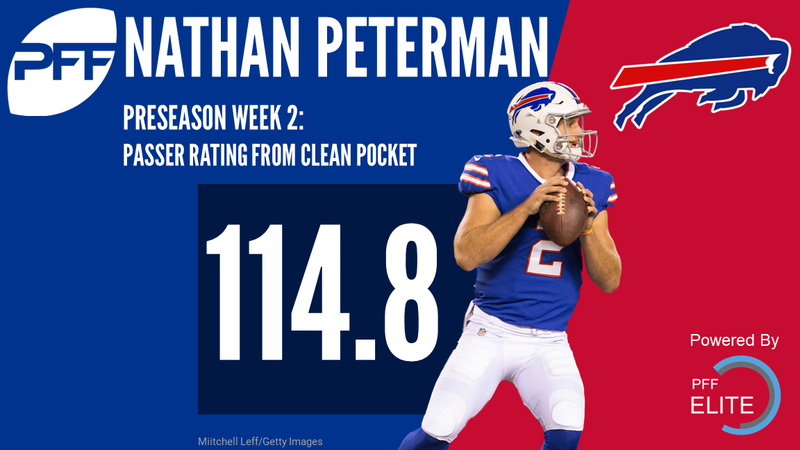 Peterman played with the second team offense and his performance echoed much of what we saw from him during Buffalo’s first preseason action: success from a clean pocket but great struggles when under pressure. The former Pitt Panther ranked 14th among 66 qualified qualified with a 114.8 passer rating from a clean pocket. He ranked 50th however, with a 39.6 passer rating when under pressure. Playing with the reserves, Bower saw his first action of the game last week with about ten minutes to go in the second quarter and then played heavily throughout the rest of the game. Bower ranked fifth among edge defenders who saw at least 20 pass-rush snaps last week with a pass-rush productivity rating of 16.3 (PRP measures pressure created on a per-snap basis, weighting towards sacks – think the inverse of PBE) after he tallied four total pressures (including a sack) on 20 pass-rush snaps. Bolden was targeted just once on offense (a target which he did not reel in) but it’s his work as a kick returner that landed him on this list this week. Bolden was our highest graded kick returner this past week, largely thanks to a 104 yard return that he brought back for a touchdown.